“I know a science teacher whose go-to book to introduce interrelationships of living things and the balance of natural ecosystems is Celia Godkin’s award-winning book Wolf Island (Fitzhenry & Whiteside, 1989/2006). I encourage a new generation of science teachers to look to her new book The Wolves Return to demonstrate those same concepts as they relate to the wolves of Yellowstone National Park and spark a new appreciation for the natural world with an aim to stewardship and not manipulation. …The Wolves Return documents in prose and detailed illustrations the impacts of the Yellowstone Wolf Project on the local habitats and wildlife, celebrating the success of reintroducing the wolves here. But the way Celia Godkin tells the story is not to just lay out that bare facts as many unseasoned writers might but instead to provide visual commentary, in words and pictures, of what would have been happening…. 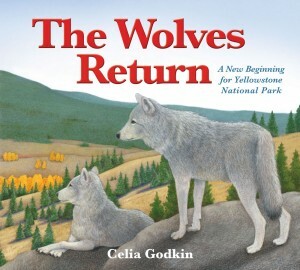 Celia Godkin illustrates the complex and sophisticated food webs–not just food chains–and evolving landscape of habitats but punctuates the story with the science of the return of the wolves in her appendices. The scientist in Celia Godkin–she has a Master’s degree in zoology–comes through in the precision of her illustrations but her coloured pencil and watercolour fine art is more expressive than just a record of the living ecosystem. She gives life to the organisms and places within The Wolves Return, though I know that young readers will be amazed by her detailed and accurate depictions of the animals.